Sharper Image Turbo-Groomer COBALT – $39.95 The premier men’s lighted grooming tool just got sleeker. Introducing the handsome, high-torque Turbo-Groomer® COBALT. Panasonic ARC IV Nano Shaver – $199.95 Panasonic’s® best linear shaver is exclusive to The Sharper Image! Built NY Wine Ratchet Magnum – $53.96 The ratchet wine opener is better than a corkscrew. Mobile-Shop – $2,999.00 The most complete set of tools ever assembled can be inventoried in 30 seconds! 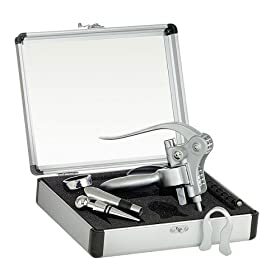 Sharper Image Deluxe Metal Corkscrew Set – $26.96 Deluxe wine tool set includes metal-gear corkscrew that effortlessly removes even stubborn corks – in one easy motion!